A weekend of Asana, Pranayama and Meditation. There is a magic in the cocktail of those three practices. In usual yoga classes, they can hardly be practiced altogether due to limited times or lack of atmosphere. When we are away on a retreat, we can experience them all. If you have never retreated before, this will be a great taster. The weekend will be a combination of dynamic and quiet practices. Feel energised, refreshed and rested! It's a beautiful venue. Have a look at the website. The cost will include Yoga & Pranayama sessions (1 session on Fri eve / 3 sessions on Sat / 2 sessions on Sun), 3 meals a day and accommodation. If the number is low then there will be 2 single room options with the extra cost. Please enquire near the time. £100 deposit (non-refundable) will secure your place. The remainder due by the 1st week of November. Or be paid directly into Aki’s account. Please contact Aki for the account details. Please notify me via email to let me know you have sent the money. Email or call me for any enquiry. Finding the centre's my on going theme and I will be sharing some of my exploration in this workshop. I feel it's going to be a good and fun workshop. Please read the below description and join me on the day if you can. For the booking for Triyoga workshop, please follow the link here. I will put the info up here as soon as I have it. What is your centre? Where is it? How does it feel? What is it for? Martial Arts talk about the energy ball in the centre. In Yoga we speak of the central axis in the body as something of fundamental importance, both physically and esoterically. - when you are dealing with stressful situations or meeting someone who makes you feel nervous, suddenly you lose perspective of what you are doing and unable to be effective with your knowledge and skills. - when practicing yoga, you're filled with tensions all over the body in your effort to achieve the pose. By finding the centre and moving from and through it, you are able to free your movement, you are able to access more strength and flexibility without unnecessary tension both in the body and the mind. As the body and mind are inseparable, re-aligning the body will naturally re-align the person. And remembering to stay in the centre mentally will help the body to come back to its centre too. Because your being will be more grounded and free, you will move with ease. Your perspective on life will change. How you relate to the world and how the world relates to you will change. Finding your centre is the journey towards a powerful and exhilarating expression of your authenticity. In this workshop, we will explore how we can find the centre in our body, using some movement exploration, vinyasa (sequenced yoga poses) and learn how to reflect it in our daily life. We live in an environment in which we are bombarded with constant stimulation. In order to cope, we shut down our senses, whether we are aware of it or not. Our sense organs become both tense and numb, and clear perception is obscured. Because we are numbed, almost paradoxically we tend to seek for more sensations. Unconscious Yoga practice isn’t an exception. Pratyahara, the 5th of the 8 limbs of yoga from Patanjali’s Yoga Sutras, holds the key to restoring our senses and helps us shift from blindly seeking more sensations to opening the senses for clear perception. Pratyahara is generally translated as ’withdrawal of the senses’. Its true meaning is often misunderstood leaving its potential unfulfilled in our practice. In this workshop, we will look into the true meaning of pratyahara and how it can both enrich our asana practices and enhance the quality of our lives. Having studied many styles of yoga, Aki Omori utilises the differences that each style offers and appreciates where they meet. Her style of teaching encourages students’ active involvement into enquiries, instead of them being passively taught. 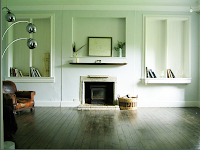 She runs workshops on Restorative Yoga and is an experienced Pranayama practitioner. She is trained in Structural Yoga Therapy and studies Somatic Movement Therapy. Dedicated to Advaita (non-dual) teaching as well as Buddhist philosophy, she enjoys sharing meditation practices and dharma teachings with her students. This to her is the most important aspect of the practice. Aki’s classes are fun and light, and yet profound. 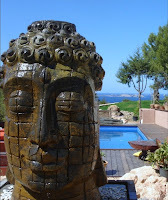 Come to a retreat with Aki and immerse yourself in daily practice at Villa Kumharas in Ibiza, Spain. 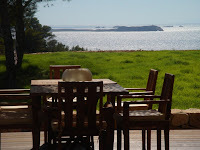 It is a totally natural, beautiful spot surrounded by sea views, pine forest, mountain paths in old rural Ibiza. A perfect venue for a retreat. COST: £610 for two people sharing. For those who wish to explore the practice to learn more about yourself through yoga. It will allow you more time and space to go deeper and unlock some holdings you carry which are preventing you to be free - to be authentic. Yoga practice ultimately comes down to knowing how to be kind to yourself and others by seeing the truth clearly through the authenticity of who you really are. And yes, of course, we’ll have fun too! 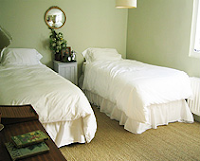 Triple room option is only available if the room is filled with 3 people willing to share with two other persons. Otherwise, everyone pays £610. If you wish to be one of the three, please state it as you book and we will let you know. All the bookings are taken by Gemma Mallol. Please see below for the details. Please do make sure to email Aki to notify her of your booking. Please state your name, address, contact number and email address as you book. Please try to book early as the spaces are very limited (9 people) and also otherwise flights can become expensive. Full payment of 610 GBP must then be received by 4 weeks before the start date. Guests making international bank transfers must add 10 Euros to the cost of the retreat to cover international bank transfer charges. Set high in the hills of Ibiza with infinity Mediterranean sea views from the lawn, Villa Kumharas sleeps 10 people in 5 bedrooms. 3 of the bedrooms are en-suite, and there is an additional main bathroom. There is a sleek uber modern kitchen, large open plan dining area, huge indoor yoga shala of 80m2 with sea views (see photo with the red sofa), and many outdoor terraces and decks that can be used for yoga and meditation, al fresco dining or just purely hanging out. Villa Kumharas has a swimming pool, its own ample secluded grounds and is surrounded by rural paths where you can walk in all directions to typical quaint villages (a rare treat in Ibiza). The finca has been recently renovated using only the very highest quality materials and has a feel of elegant and homely simplicity, perfect for immersion in yoga. There are sabina wood beams throughout, both tiled and wooden floors, marble surfaces, balinese tiles and stonework, antique asian artifacts and decor, and stylish, comfortable furniture throughout. Villa Kumharas is centrally heated, and as such lovely in all seasons. At the Ibiza Yoga Retreat we offer a diverse and delicious selection of vegetarian health food prepared and cooked by yoga people for our yoga guests. We use local fruit and vegetables and organic grains, pulses and rice. At Villa Kumharas we provide 2 meals per day. 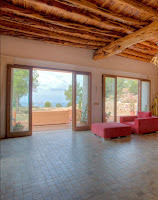 On a retreat there is a large brunch after yoga and a buffet style evening meal. Should guests require further snacks during the day there is an additional fresh juice and healthy snack menu. Guests are welcome to all day tea, coffee and mineral water. At the Ibiza Yoga Retreat we also provide a range of therapies, massages and extra-curricular activities for guests to choose from should they so wish. The venue is normally rented out for much higher prices. This is their first year promotional price for their yoga retreats. If you have any enquiry regarding booking, payment, traveling, anything else to do with the venue, please email or call Gemma Mallol. time so that you get adequate rest. * A direct transfer is arranged by the venue from the airport to Villa Kumharas this will meet the Stanstead Ryan Air flight coming arriving in Ibiza on the Thursday evening. This will cost 7 Euros per person each way. Please let us know what time you are arriving as we need to know in advance to know how many cars to send. * If you arrive on another flight you will need to get a taxi on your own to Villa Kumharas, nr. 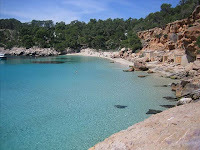 Cala Salada on the west side of the island. We will email you a map. A taxi will cost you approx 25 Euros one way. If you get lost just stay at the entrance to Cala Salada beach and call or text and we will direct the cab driver to the house which is a few minutes drive away up the hill. * It is perfectly acceptable to hire a car if you want to explore the island... again let us know if this is your idea and we will email you a map of how to get to Villa Kumharas. * www.easyjet.com for flights from Stanstead, Luton, Gatwick, Bristol and East Midlands and various other UK airports. Yoga - when practiced daily, you will really feel the difference.